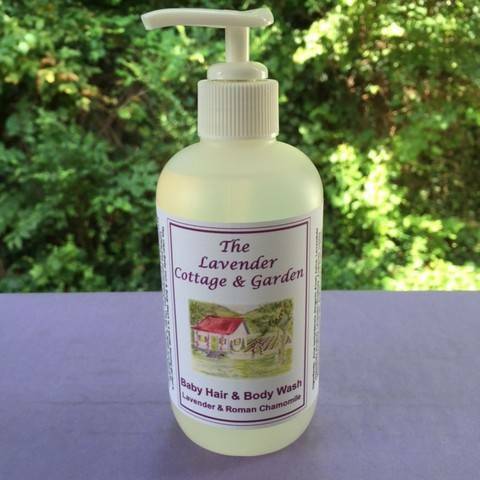 This clear Baby Hair & Body Wash is a gentle foaming gel that is paraben-free. The gel is lightly scented with essential oils at a low and safe percentage. Ingredients: Aloe barbadensis (Organic Aloe) Juice, Lavandula angustifolia (Organic Lavender) Distillate, Anthemis nobilis (Roman Chamomile) Distillate, Sodium Lauryl Sulfoacetate, Cocamidopropyl Betaine, Disodium Laureth Sulfosuccinate, Kosher Vegetable Glycerin, Phenoxyethanol, Calcium d-Pantothenate (Pro-Vitamin B5), Matricaria chamomilla (German Chamomile) Essential Oil, Anthemis nobilis (Roman Chamomile) Essential Oil, Lavandula officinalis (Organic Lavender) Essential Oil, Hydrolyzed Wheat Proteins, Simmondsia chinensis (Jojoba) Oil, Rosa mosqueta (Rosehip) Seed Oil, Tocopherol (Vitamin E), Tetrasodium EDTA, Citric Acid.